Israeli soldiers invaded, on Tuesday at night, Toura village, in Ya’bad area, southwest of the northern West Bank city of Jenin, and caused dozens of Palestinians to suffer the effects of teargas inhalation. The soldiers also invaded homes in a town, near the southern West Bank city of Hebron. 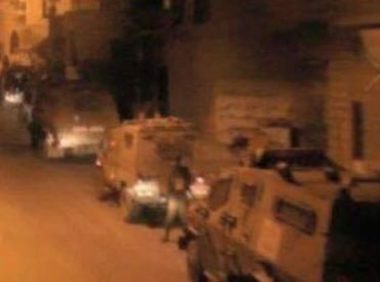 Media sources in Jenin said several army vehicles invaded Toura village, and drove provocatively in many neighborhoods, before firing gas bombs at Palestinians in the street, and many surrounding homes. They added that many gas bombs struck homes in the town, causing dozens of Palestinians, including children, to suffer the effects of teargas inhalation. The families had to leave their homes due to the excessive amount of gas from the bombs. In Hebron governorate, in the southern part of the West Bank, the soldiers invaded many neighborhoods in Yatta town, south of Hebron city, before breaking into and violently searching many homes. The soldiers forced the families in one room in their homes, while searching and ransacking their properties. Owners of five of the invaded and searched homes have been identified as Mohammad Mahmoud Najjar, Nafez Mohammad al-‘Amour, Rafat al-Adra, Azzam Khalil Makhamra and Amjad Mahmoud Najjar.